Pocket Dictate is a voice recorder for a palm sized Pocket PC. You dictate directly on your Pocket PC using the buttons on the unit. When done, tap send and the dictation will be compressed, encrypted and sent to your typist by email automatically. For ease of use, operation of the record and playback features is designed to closely mimic that of old style dictation recorders. For example, you record by holding down the record button on the side of your Pocket PC. Release the button to stop. To continue from where you were press it down again. You can also playback, rewind, insert or overwrite as required using the keys on the front. 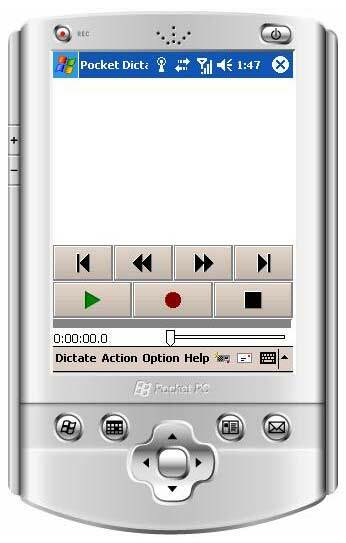 Features: * Record and playback dictation using the buttons on the Pocket PC. * Editing, inserting and overwriting. You can select between record overwrite, record insert and record end modes. * Optional voice activated recording. When selected Pocket Dictate only records while you are speaking. * Automatic compression of audio files to reduce upload times and storage requirements. * Encryption of recordings prior to transmission to comply with patient or client confidentiality requirements. * Sends recording in compressed wave (wav) or dictation (dct) file formats. Other professional versions available from NCH Software. About NCH Software NCH Software is a leader in audio, video, music, mp3, cd, dvd, telephony, dictation, transcription, business, and computer utility software for Windows, Palm, Pocket PC and Mac OS X. NCH has released over 80 products since 1993 and have received many awards for software excellence. Download Software for DJ, broadcast, stream, record, edit, convert, burn, mix, split, tag, rip and play audio files for wav, mp3, and other popular file formats. This site does not contain serial number, crack, keygen Pocket Dictate Dictation Recorder serial number : serial number is the simplest type of crack. A serial number(cdkey,product key,etc) is register the program as you may already know. a crack or keygen may contain harmful software. If you cannot find the exact version you want, just give it a try. for more information read .nfo/.txt/.diz file include in zipped file.